When my kids were little, getting them out the door turned into a major military operation with me as the commander-in-chief. I’d rush around to grab snacks, extra clothes, and playthings to entertain them in the car. Next I’d herd everyone to the bathroom and then to the door. I’d sweat over putting everyone’s shoes on. A few years went by, and I’d break out in a sweat watching them grapple to get their shoes on themselves. I didn’t like the person I became during those mad dashes out of the house. I’d bark out orders, roll my eyes, and yell, “Come on, guys!” I blamed my bad attitude on my kids, who constantly made us late. In reality, I was the one who hadn’t left enough margin in my schedule for the “I-need-a-miracle-now” feat of getting two toddlers out the door. Although now the game has changed with my adolescent daughter, I can still turn into someone I don’t like while I hurry her out the door. She’s a beautiful girl who likes to look her best before she leaves the house. I’m an impatient mom who taps my foot and yells out, “Ready to go?” several times while waiting. Hurry is not my friend. Hurry steals my joy and turns me into someone I don’t want to be. Maybe I should let my daughter be my life coach. While she finishes her makeup, perhaps I should go work on mine a bit more. I’d probably look better, and it would give me a chance to pray for the Holy Spirit to pour more of His love and peace over me. 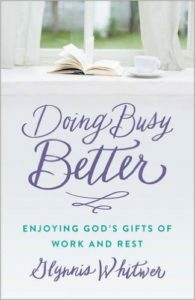 In her book Doing Busy Better, Glynnis Whitwer says hurry is never worth it. The benefit of getting somewhere a few minutes quicker never outweighs the stress, relationship friction, and general bad mojo caused by hurry. “Hurry and love are incompatible,” Glynnis writes, “because a hurried person is more concerned with their own agenda than with others…” (p. 92). How many times do I allow hurry to keep me from being fully engaged with people I love at home and in ministry? I need more margin in my daily life. I can set a reset button on life each Sunday. When I follow God’s leading and am careful to plan well, I can work peacefully and productively. If you’re anything like me and feel overwhelmed by your life, this book just might help you learn more about beating the busy monster. Doing Busy Better was released July 4th. Follow this link for more information. I link up with Kelly Balarie’s #RaRaLinkup, Holley Gerth’s Coffee for your Heart, Crystal Storms’ #HeartEncouragement, Salt and Light with Shannon Guerin, and Arabah Joy’s Grace and Truth. Check out these communities for more encouragement. Thanks for this review, Betsy! I read Glynnis’s previous book, and I love her voice — so down to earth and wise! I read the previous book too. 🙂 This is right where I need all the help I can get. I think one of the key words is “plan”. I find when I plan better and more time to get ready, do things, things ultimately work out better. As I’ve gotten older, I’ve cut out a lot of the things I thought I HAD to do and there is more peace in simplicity.. I can be more intentional when i don’t try to squeeze excessive things on my to-do list into one day. Perhaps I’ve gotten more realistic?? Learning not to be defined by how much I get done in one day. I’m loved whether its 20 things or just 2. Some great reminders here…thanks. I loved one point from this book, Bev: that God only had 2 or 3 things to do each day of creation. 🙂 Why then do I complicate my life by making a list of 23 items that have to be accomplished by noon each day?! Planning is key, and planned simplicity brings peace. Now if I could just do that! I’ve enjoyed this book so much. Thanks for sharing your takeaways, Betsy! As a young, frequently unorganized mother of 3 kids in 4 years, I used to tease my sister that as long as she got where she was going with all 3 kids she was doing fine. As a hurried, perfectionist mom, those words frequently came back to me. It reminded me to keep priorities straight, and everything else will take care of itself or fall away. I must confess, though, I’might much better at this with my granddaughters than I was with our kids. Thanks for the reminder that being prepared can make all the difference. Yes, surely by the time I’m a grandmother, I’ll be better equipped to handle life! 😉 I’m hoping. Letting go of perfectionism, when I manage it, helps me too. Thanks for sharing your experience, Alice. Betsy, you described ME in your opening paragraphs! I need to read this book, and I’m glad you posted a review. I hope to meet Glynnis in person when I attend She Speaks, just two weeks from today! Sharing your post on FB and Twitter. Thanks, Sarah. I’m so glad you’re going to She Speaks! That’s wonderful. I hope you’ll have a fun and profitable time there and learn lots. I went 3 years ago and loved it. This is exactly what God is speaking to me about right now. I shared this someone who recently if that’s all then your must be a saint. But they didn’t get that Doing doing doing and not getting to bed when I should steals my time with God and fatigue my ability to sense his presence and leading and joy. This is a huge issue Thank you and Thanks to Glynnis. I love the way Glynnis distinguishes between hurry and busy. It helped so much! Love your takeaways! Such a wise book from a wise woman. I’m getting this today and can’t wait to read it. Glynnis has truly met a great need with this book! We are all guilty of those “comMOMder-in-chief” moments! 😂 I LOVE your take-aways, Betsy. I’m ready to do busy better! I hope the book blesses and encourages you, Rebecca Lynn! Thank you for reviewing this book! I immediately went to my paperbackswap account and requested it! Thank you for sharing! I love love love margins. In every way, shape, and form. Without their grace-filled boundaries, I’d be a beast. Oh Linda, you’re making me smile today. Thank you. Loved this book and Glynnis’ words of wisdom. And oh my, how our hurried little selves sound errily familiar. I was one of those “leave little margin” mamas, too. This entire post resonated with me. I’ve got to let go of my own agendas, and be more present in my own realities. I’ve pinned this and bookmarked it to buy the book on my next paycheck. I’ve begun to realize just how important margin is in my life the last couple of years. I do pretty well with it when I’m not too busy, but ironically when I get busy, it doesn’t happen as well. My favorite quote from this post: “The benefit of getting somewhere a few minutes quicker never outweighs the stress, relationship friction, and general bad mojo caused by hurry. “Hurry and love are incompatible,” Glynnis writes, “because a hurried person is more concerned with their own agenda than with others…” (p. 92).” So true! How often haven’t I yelled at someone to hurry up and had them feel so very sad. It certainly doesn’t make for good relationships. One thing that helps me, is to make sure that I am getting ready to leave early so I don’t feel as anxious about being late. One of my favorite preachers once said Jesus was never in a hurry. I’ve been reminded of that almost everyday. 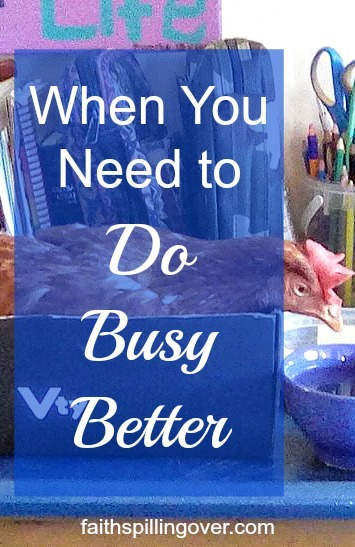 With small children at home I often feel the pressure of busy! and I don’t like it. I’m still a work in progress as I slow down and make practical expectations for everyday. Hurry is definitely not my friend either! 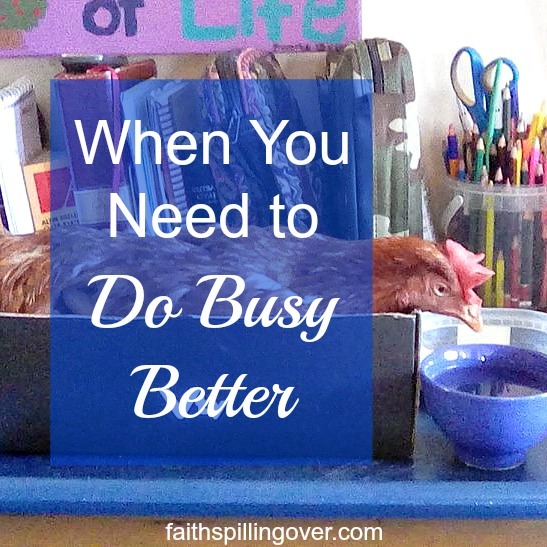 I’m reading Grace Not Perfection by Emile Ley, and it too is helping me to do busy better. My biggest challenge is not giving myself enough margin. Best to you as you gear up to a calmer and more productive busy. Hurry has been an issue for me. It is incredibly humbling to realize that hurrying is more about my own agenda than others. I am working on doing things earlier, getting up earlier, and also not adding things that deep down I know I don’t have time for. I also need to remind myself that my worth does not come from what I accomplish but whose I am. Beautiful post Betsy!! Thanks so much, Desiree. Yes, I’d never looked at hurry that way until I read Glynnis’s book. 🙂 Never thought how often it’s because I’m putting “me” at the center.